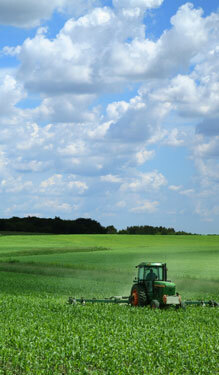 The face of American agriculture is undergoing a dramatic shift. As the overall farm population ages over the next 20 years, 70 percent of farmland is expected to change hands and women may own up to 75 percent of the land that is transferred. Along with this changing demographic comes a new set of stories about what brought them to the land and a unique vision for it into the future. On April 16, we worked with the Woman, Food and Agriculture Network (WFAN) and local partners to gather women farmland owners together for the first Lady Landowner Learning Circle in Illinois. It was a chance to learn from each other and to learn together about how their stories and visions may shape the landscape over the next several decades. Learning circles, pioneered by WFAN, are participatory meetings where 12 to 25 women landowners come together in an informal, female-only setting to discuss their land and their hopes for that land. Their concerns guide the discussion. Although local female agricultural professionals join in to help provide answers, there are no formal presentations and everyone talks and listens and responds. Challenges faced by female landowners were at the forefront of the discussion. What happens when sons and daughters decide not to return to the farm? As one woman explained, she lives on a centennial farm—meaning it has been operated by the same family for at least 100 years— is now leasing the 300 acres to the neighbor to farm. Her children plan to remain in their off-farm jobs, a far cry from the days when she and her husband rented additional acres, are not interested in farming. When she farmed with her husband, they rented additional acres. Illness or death of a husband or other patriarch was another common theme among the participants. One woman grew up on a 25-acre strawberry farm in Massachusetts and married an Illinois farmer. When her husband died 11 years ago, she took over farming their 200 acres. She now leases the land to her husband’s best friend and insists on conservation practices on the land. Female landowners tend to have different goals for their land (like conserving their land and soils, having a diversity of crops and farm projects, protecting their families and contributing to the community). They see land as a community asset, a place of beauty and a legacy and these characteristics make them perfect conservation partners. While most women possess a strong conservation ethic, they are often unsure of how to translate those values into action. WFAN has shown that peer group information sharing is very effective with women. 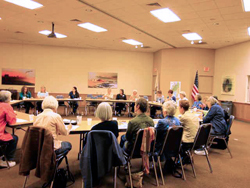 Within a year of attending a WFAN “learning circle” meetings, over 50 percent of participants take at least one conservation action on their land and become motivated advocates for improved conservation. The day culminates with a bus tour to see first-hand how some of their concerns can be addressed by conservation practices. We toured the Upper Salt Fork watershed where AFT and its partners are actively working with many of the approximately 130 farmers in the Upper Salt Fork segment of the Spoon River to significantly reduce the run-off of nutrients from farm fields. From the questions and comments on the bus, it was clear to see that the conversations and tour had really made an impact as several women appeared determined to get more conservation practices on their land. The next 10 years represent a significant window of opportunity for engaging women landowners in conservation. For various reasons, this audience has traditionally been under-served in agency outreach in spite of their interest in conservation. Efforts like those by WFAN show that once women landowners are given the information and encouragement they need to take action, they will do so. Effective outreach to this population can have significant impact on the soil and water quality of the Mississippi River basin, if we act now before the next wave of land transitions begins. American Farmland Trust would like to recognize the partners that made this day possible: Woman, Food and Agriculture Network (WFAN), Prairie Rivers and the Champaign County Farm Bureau to hold the first women’s learning circle meeting in Illinois. The Lumpkin Family Foundation and WFAN (through a McKnight Foundation grant) provided funding for this effort. This entry was posted in Conservation, Illinois and tagged conservation, female landowners, illinois, Women Food and Agriculture Network on April 19, 2012 by Ann Sorensen. Another year has passed, and with it a year of exciting new projects and partnerships to protect the priceless farmland resources of the Midwest. Farmers throughout the region are finding ways to be better stewards of the land, while farmers and citizens alike are fighting for policies and programs that keep farmland in farming even with state budget issues and shifting farm ownership demographics looming. In the Upper Salt Fork watershed in central Illinois, our work with farmers to reduce fertilizer and soil runoff into the Mississippi River basin has so far resulted in new conservation practices on nearly 4,000 acres of the 27,000-acre watershed. In Lake Erie, where a record toxic algal bloom spread, adding to the “dead zone” threatening the area’s $10 billion annual tourism industry, we’re working with farmers to reduce phosphorus runoff, which contributes to the problem. And in the Ohio River Basin, we’re starting to recruit farmers to participate in pilot trades that could lead to the nation’s largest water quality trading program. Working with the Environmental Protection Agency, we have five projects underway to help fruit and vegetable farmers in the Midwest control insects, weeds, plant diseases and other pests while protecting the environment and remaining profitable. In Michigan, we’re helping cherry growers manage pesky flies, while in Minnesota we’ve helped strawberry, pumpkin and potato growers control weeds without chemicals. Currently, nearly 90 percent of farm owners are not farm operators, with absentee landlords owning 44 percent of the nation’s farmland. Along with key partners in Iowa, we launched a project to learn about the impacts of absentee landowners, the adoption of conservation practices on leased land and how to help owners and operators discuss conservation challenges. Just two years ago, we led the drive to pass Wisconsin’s Working Lands Initiative and create a new Farmland Preservation Program, much needed in a pivotal farm state losing its fertile farmland to development. But when Governor Scott Walker put promised funds for the program on hold and called for eliminating it entirely, American Farmland Trust mobilized farmers, activists and citizens. The state legislature listened, keeping the program intact and restoring funds for already approved projects. Due to the age of many farmers, within 20 years about 70 percent of farmland will change hands, and women may own up to 75 percent of it. While possessing a strong conservation ethic, many women are unsure of how to take action to protect and conserve their land. We’ve started the planning process to hold women-only meetings to educate women who own farmland in the Midwest, helping to address such barriers. For more than 25 years, we have been working to protect farmland through preservation and conservation efforts throughout the Midwest. In the breadbasket of the nation, we know we can’t afford to take these priceless resources for granted. That’s why we will continue our work throughout the Midwest in the coming year and beyond. This entry was posted in Agriculture and Environment, Farmland Protection, Illinois, Iowa, Ohio, Wisconsin and tagged conservation, Farmland Protection, land ownnership, pest management, Water Quality on December 8, 2011 by Ann Sorensen.